"Working with Sorokin has been a complete pleasure , not only have I ended up with a great logo but I've also had my logo put on many backgrounds that I can use in the future. Highly recommended , very skilled with a unique style. Great job ! " 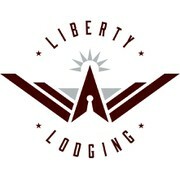 "Liberty Lodging was looking for a design that portrayed modern simplicity and encompassed both the lodging and military aspects of our company. Sorokin did a great job of capturing that essence in this design. He was very willing to work with us through..."